My primary means of transportation for three months. 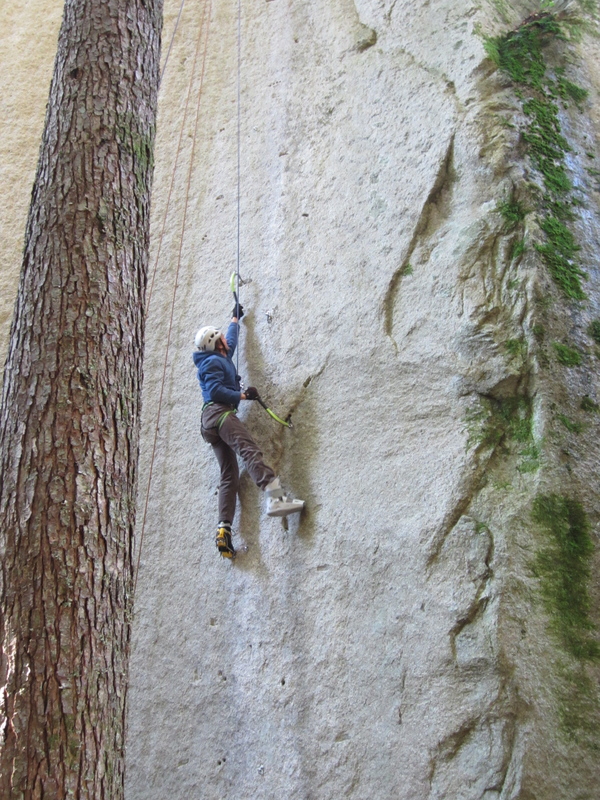 Four months ago, I slipped while topping out a boulder problem in the forest below the Grand Wall. I fell awkwardly, missed my crash pad, and landed squarely on my heel. I made it out of the boulders and to the hospital thanks to the kind assistance of my friend Tony. 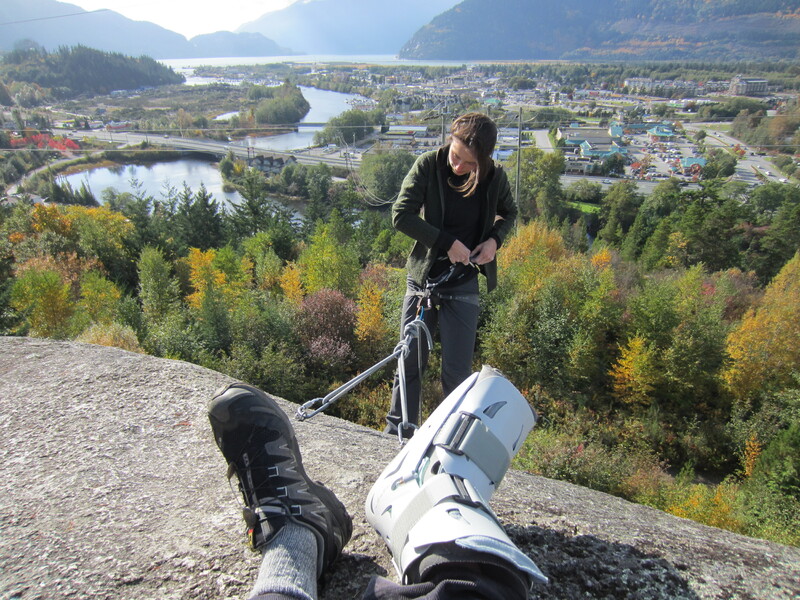 The doctor in Emergency happened to be a boulderer himself, and it was with genuine sympathy that he informed me that my heel (“left calcaneus”) was broken. Eric learning to aid climbing. 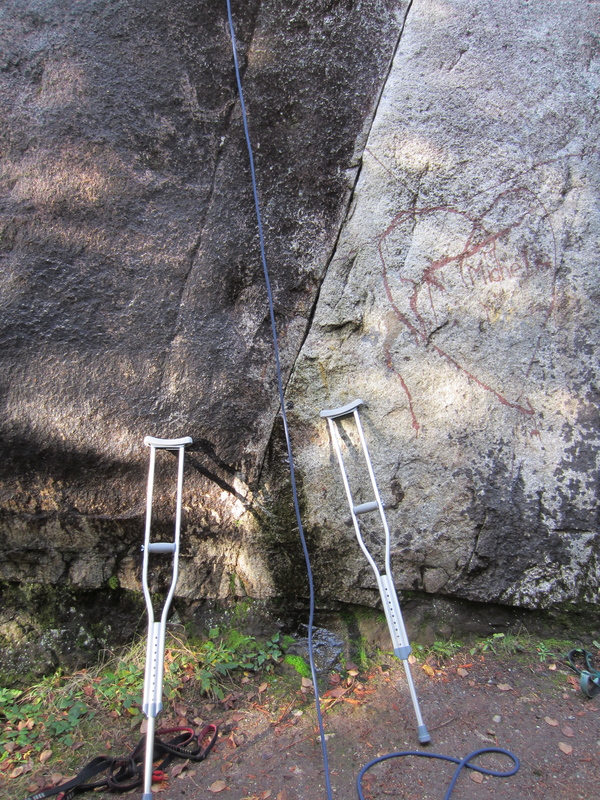 I was able to crutch up to the crag and shout instructions. This seemingly minor injury confined me to an extremely sedentary lifestyle for three months. 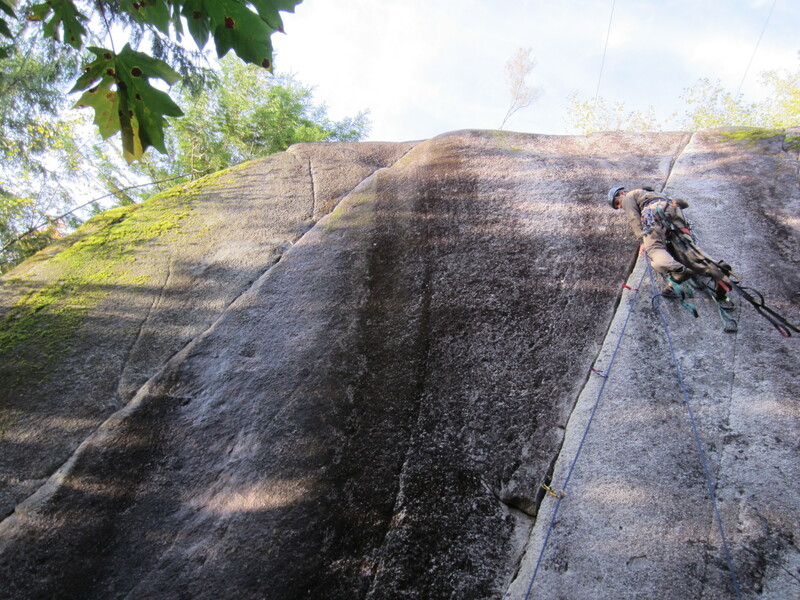 The good news is that there’s more to life than climbing. Being injured has been a good opportunity to focus on more intellectual hobbies (although blogging was clearly not one of them). It’s also been a good chance to visit with (or perhaps test the patience of) friends and family. In particular, I’d like to thank Karina and my aunt Sue for their generosity. My view from the top of the crag while Karina gets in a few pitches of self-belayed climbing on a sunny afternoon in the Smoke Bluffs. Being injured has made me thankful that I’m not too much of a type-A nutcase. I’m quite capable of sitting around for weeks at a time without doing much of anything – an ability that’s only really an asset while injured or storm-bound on an expedition. Nonetheless, a person can only spent so much time studying philosophy, reading Joyce’s Ulysses and writing short stories (a more honest list would include watching TV shows on my computer, researching ski gear on the internet, and reading british crime fiction) without getting a bit restless. Luckily, there are many opportunities for one-legged recreating within easy crutching distance of my front door. 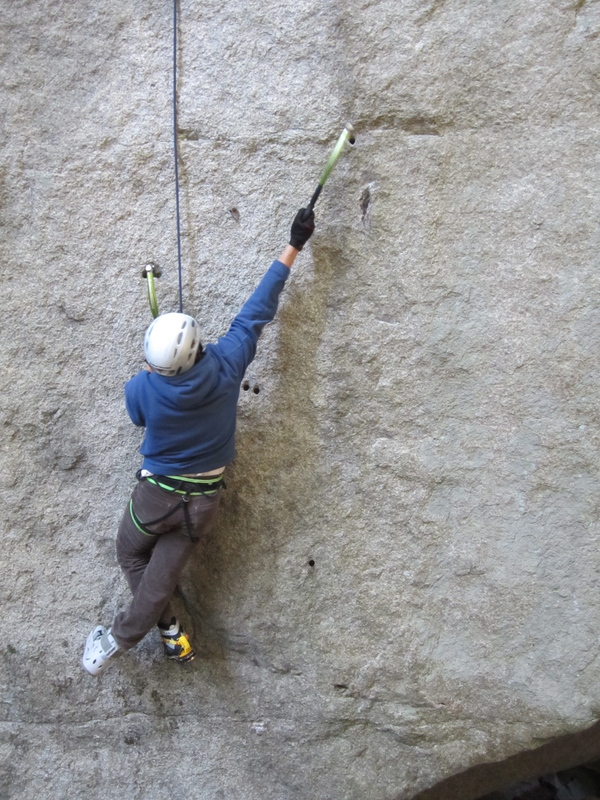 Drytooling on the drilled pockets of the Cacodemon Boulder. A few interesting things happen if you sit on the couch for months on end. Not surprisingly, if you continue to eat as you did before, you’re likely to gain some weight. Thanks to the complex that my university track and cross country teammates gave me years ago, it will likely be months before I’ll feel comfortable taking my shirt off in public. Further, the muscles in your unused leg begin to atrophy. The circumference of my forearm is currently greater than that of my right calf (the hangboard in my room hasn’t been completely neglected). Large chunks of toughened skin peel from your feet in the bath. While fat accumulates elsewhere, the protective fat pad under your heel disappears and takes months of walking to build up again. In short, when you eventually get off the couch, you’re likely to be even weaker and more whiny than you were before. This photo might give you the false impression that I'm reasonably capable in spite of being crippled. In fact, my forearms very nearly exploded shortly after this; something that might have more to do with months of inactivity than with my bum foot. On the climbing front, I’ve had plenty of time to research and make plans for the coming year. If I’m able to accomplish even a small percentage of my goals, I may actually have something worth writing about here in 2012. 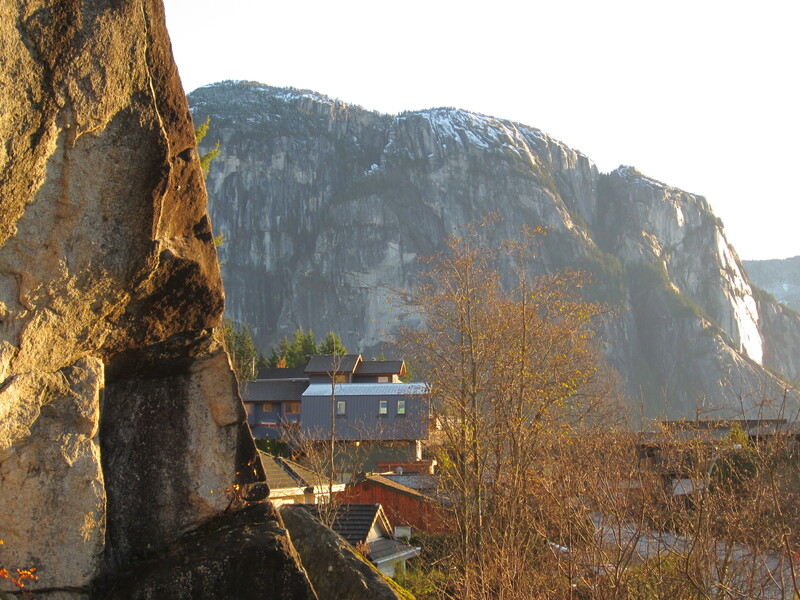 The view from the Smoke Bluffs on a sunny winter evening. A fully functioning ascent of Fungus Razor shortly before my mishap. 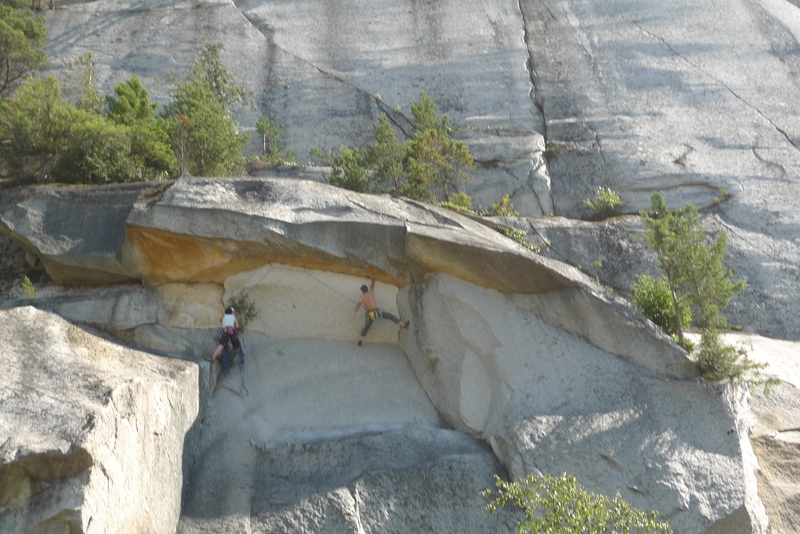 Although it may be a while before I take my shirt off again, it won't be long until I'm back rock climbing. Thanks for the mention, [no patience required, really! I got some good book suggestions in return].